Standing portrait of a Native American Flathead (Salish) man, identified as Basso Jacko, Elmo, Montana. 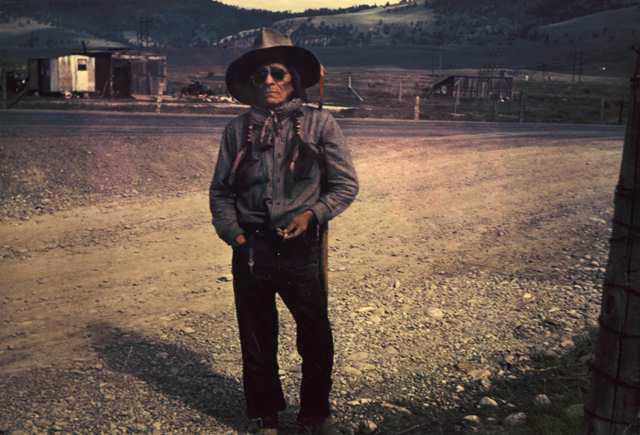 He wears dark pants, a loose shirt, a kerchief, long braids bound by strips of fur, sunglasses, and a broad brimmed hat. 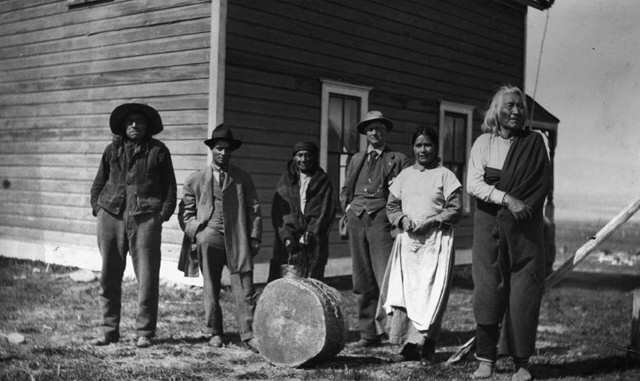 Standing portrait of a white man and five Native American Flatheads (Salish). Identification (right to left) Michael Wyateelame, an elderly man, his wife, Susie Magpie, and Forest guard Harold Flower (white), Camas Prairie, Flathead Indian Reservation, Montana. Michel’s home is in back of the group, a drum is in front of the group. 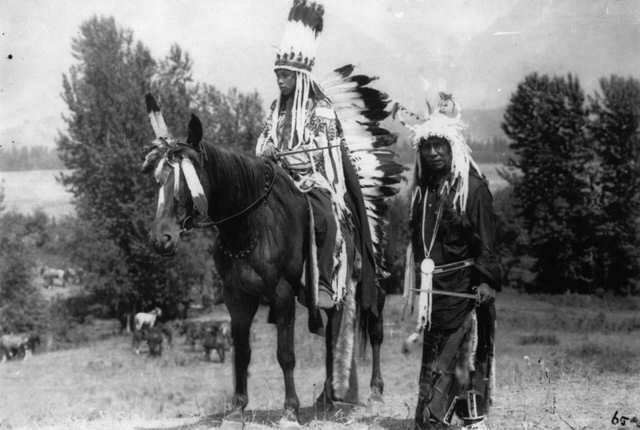 A group of Native American Flatheads (Salish), identified as the Finleys, pose on the Flathead Reservation in western Montana. 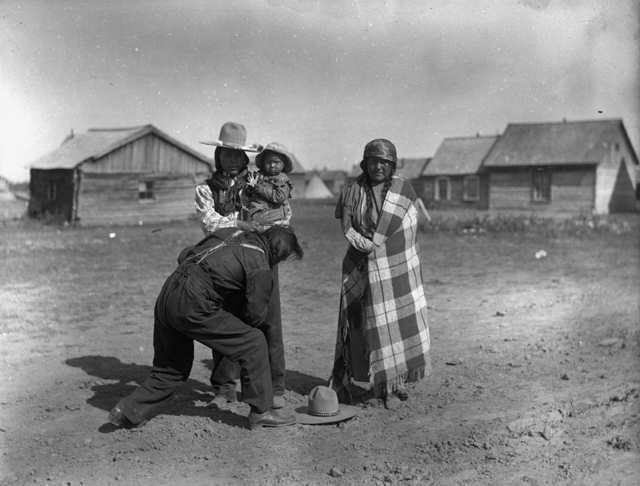 The husband holds a young chief in his arms as his wife, Helena (Helen) Finley, stands nearby. Helena’s father stoops in front of the husband. Reservation buildings in background. 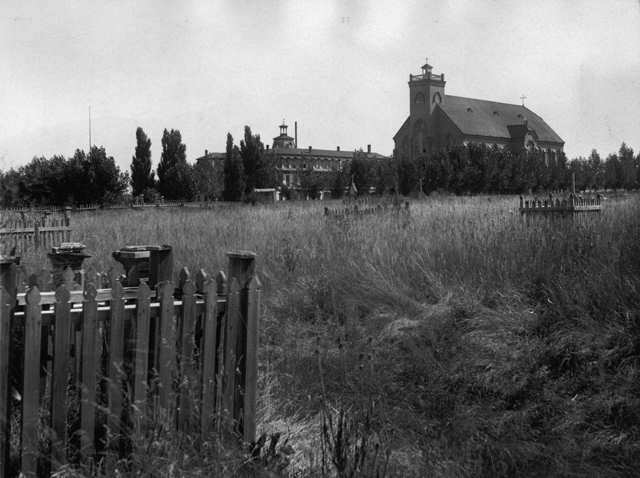 Grave sites surrounded by wooden fences occupy an open field near the Saint Ignatius Catholic Church at the Saint Ignatius Mission on the Flathead Reservation for Native Americans in western Montana. The church is a brick structure with a clipped hip roof, widow’s walk, belfry, and arched windows. Three young Native Americans (Flathead) stand in front of a tepee on the Flathead Reservation near Polson, Montana. 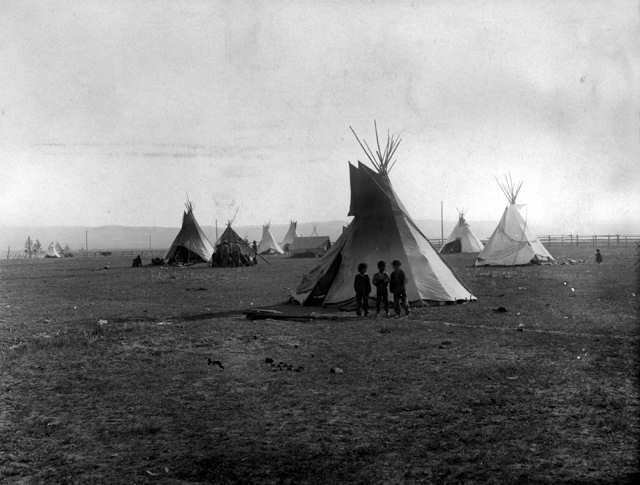 Shows tepees and a group of adults huddled in a circle. View of two Native American Flathead (Salish) men. One is on a horse and is identified as Pateenenemae. He wears moccasins, leggings, a shirt decorated with fur, and a long headdress decorated with fur and eagle feathers. 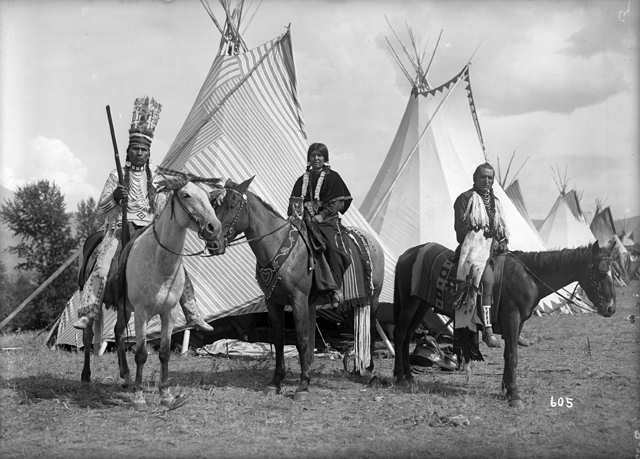 The other man, identified as Lhekakah (Chil-lum), stands next to the horse and wears moccasins, leggings, a blanket wrapped around his waist, a loose, dark shirt, a necklace, and a buffalo headdress. Both men carry swords in their hands. A group of Native Americans gathers for a group portrait in front of several teepees on the Flathead Indian Reservation in western Montana. Several of the men, including Ka-Ka-She, wear tall, feather headdresses and long beaded necklaces; several also wear patterned vests and fur tassels. 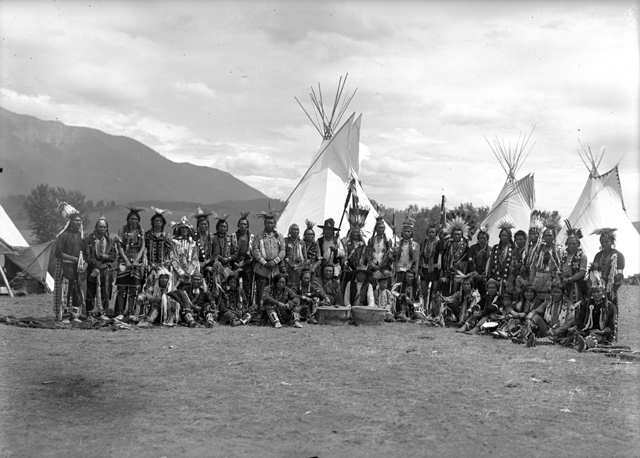 Other identified men are Stmilx, Snsale and Baptise (Parnish (a Nez Perce); the men in the front row sit on the ground while those in the back row are standing. Two large drums are in front of the men in the center of the front row. A ridge of mountains is in the distance. fur wrapped around his braids, numerous necklaces, and a cluster of ermine fur strips from each shoulder; he holds a folded animal skin with a large feather bustle over his right arm. The woman sits on a horse between the men. Her braids are wrapped in light-colored fur, and she wears large, round earrings. The teepee behind the woman has a striped pattern. Mose Vanderburg, a Native American man on the Flathead Indian Reservation in western Montana, sits on the ground in front of a teepee playing a drum. 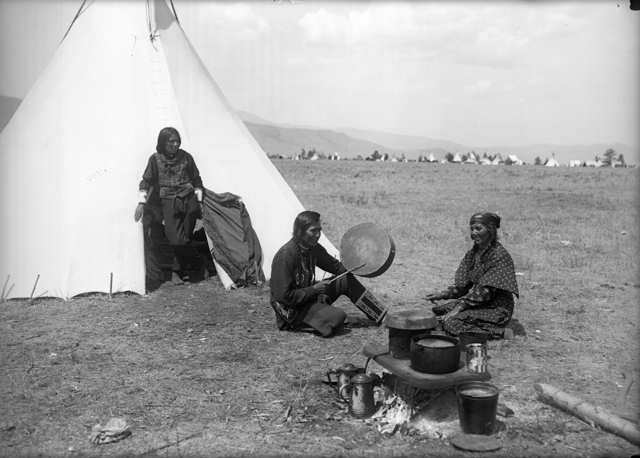 His wife sits near him and a young man, possibly Pete Vanderburg, stands in the entrance to the teepee. Several pots are cooking over the campfire in the foreground. Numerous additional teepees are in the distance near the base of a ridge of mountains.